This is just a quick post to give you a couple of updates regarding my upvote bot service. I am always looking at the current market, how content creators are using my service, and adjusting as needed. This ensures the best results (or ROI) for those using my service and the people who have delegated to it. For (at least) a limited time, I felt that the minimum ROI for my upvote bot needed to be increased. The price of Steem is extremely low and we are getting paid out completely in Steem, which does not equate to the amounts you see under your posts. So I feel it's important for those running upvote services to increase their minimum ROI as the markets drop.. and I'm doing just that. For the last couple of months I've had my service set to a minimum of 1% ROI. However, this still doesn't give quite enough room to break even for upvote buyers, so I've now increased this to 3% ROI and will keep an eye on the markets to see if further changes need to be made. Over the last few weeks we've gained a LOT of new investors who have delegated to my service. This is great as it allows minnowfund to build faster and support more and more Steemians over time. This also means that the upvote from my bot is worth a lot more than it used to be. 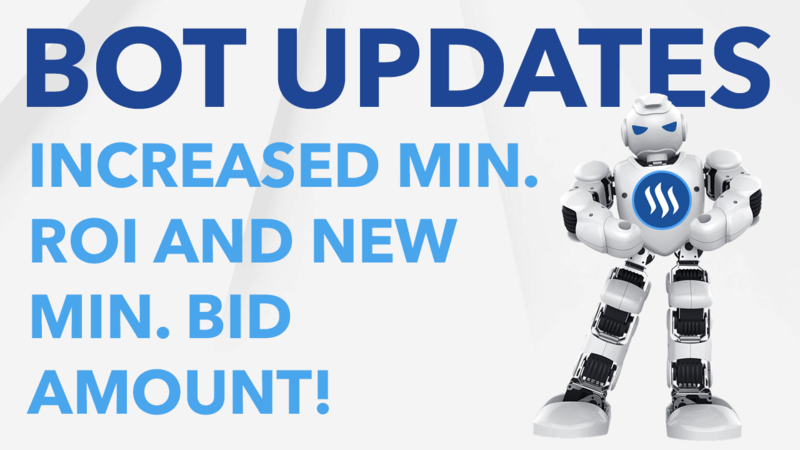 We've finally reached a point where I feel an increase in minimum bid is warranted. So I've increased the minimum from 0.05 Steem or SBD to 0.10 Steem or SBD. I know, not a huge difference but it should bring in more appropriate bids for the upvote we have to offer. If you have any questions or concerns regarding my upvote service, please reach out to me directly on steem.chat (name @brandonfrye) and I will happily assist you there! Or you can click this link where you can vote securely using SteemConnect. Steemit Weekend Update: What's Happened to the Market? And Quick Witness Update! Understanding Hardfork 20: What in the Heck Are Resource Credits!? What Makes Steem So Attractive... Even in a Bear Market? Hey brandon thanks for your services on steemit, including your bot, wondering your thoughts on steemua? Seems like a great new delegation geared at rewarded minnows. Thoughts? I actually haven't had a chance to really look into it but I plan to. I know there's been a lot of buzz going on about it lately. Adapting to a dynamic market is important to remain relevant. This should help get more activity on the service despite the slowdown we have been seeinf in all areas of the blockchain recently. Thanks for the update! You do an excellent job, Brandon. Your bot is really worth it. These are welcome changes for such a time as this when the market is down.